Paraben, chemical and nasties free! Here at StressNoMore HQ we are always on the lookout for innovative new products and naturally occurring ingredients. We are passionate about keeping things as natural and pure as possible to make sure you always receive a quality product. The great thing is that we also like to think outside the box and want to make you aware of the different uses for some things you may have never considered. It’s still hot in the press that many deodorants are thought to contribute to women developing breast cancer due to the harmful chemicals used which then get absorbed into the skin surrounding the breast tissue and glands. You can read more in depth about this issue on the National Cancer Institute’s website. Prevention is better than the cure so we are going to show you how you can use deodorant, but without the worry of the harmful effects. How do you fancy learning to make your own deodorant using a couple of the beautiful, natural products from the StressNoMore shop? Put your creative cap on because we are going to show you how! What will you need? It’s simple! Step 1: In a mixing bowl, blend together your baking soda and corn starch. If you are allergic to corn-starch then arrowroot powder is a great alternative. Step 2: Scoop about 4 tablespoons of coconut oil and add it to your building mixture. The coconut oils is incredible for so many reasons, some being that it is great for your skin, is antibacterial and absorbs beautifully, not to mention it smells divine. Step 3: Blend your ingredients together if it seems a little too dry then add a bit more coconut oil. The consistency should be pretty thick. Step 4: Add the ¼ teaspoon of jojoba oil as its makes for a beautiful moisturiser and will pamper your underarm skin – mix well. Step 5: Add and mix in about 6 drops of lemon and rosemary essential oil so it smells delicious and fresh! Step 6: Last but not least, scoop out your mixture and put it into your chosen container! There you have it – a deodorant completely made by you that doesn’t contain any hidden nasty chemicals or parabens! You will be surprised how easy it is to make and how long it lasts! To apply the deodorant simple scoop some in your hands and rub into your dry armpits. 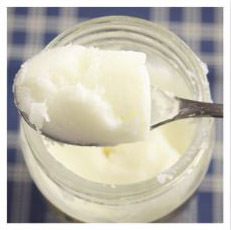 Make sure you store it in a cool dry place because if the coconut oil gets warm it will start to melt and you don’t want to be pouring it onto into your pits!